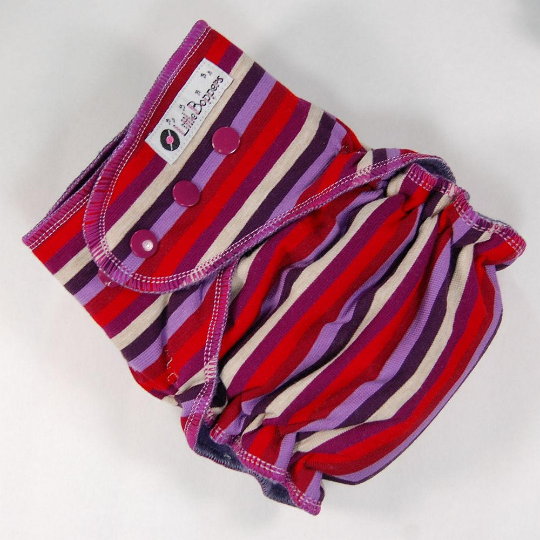 This listing is for a Made-to-Order (You Pick Size and Style) Cloth Diaper or Diaper Cover in the "Berry Multi Stripes" cotton/poly knit. The pictures are representative of the print (made into a Medium/Long Hidden-PUL AI2), but your specific diaper may look slightly different. - or choose One Size (10-40 lbs) that includes a fold-down rise and adjustable soaker. - or Wind Pro Diaper Cover (a waterproof cover with breathable Wind Pro fleece to be worn OVER a separate diaper). All products are Made-to-Order, especially for your baby. Orders are made and shipped in the order in which they were received. Most orders ship within 3 weeks of purchase. You may check on the status of your order at any time by emailing anne@littleboppers.com. 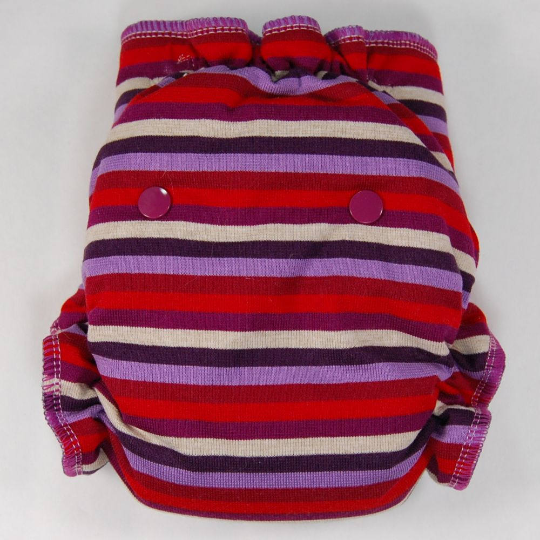 What Style of cloth diapering product are you looking for? Little Boppers products are available in two kinds of AI2 (Hidden-PUL or Wind Pro), two kinds of Fitteds (Hybrid or Traditional), and in two kinds of Covers (Hidden-PUL or Wind Pro). What are AI2s? All-in-Two diapers (aka AI2) are "All" you need, in "2" pieces: the shell and the soaker/insert. The outer shell is waterproof and it functions like a diaper cover. The soaker (also called insert) is the absorbent part that snaps into the inside of the shell. If only the insert becomes wet, you can simply switch out a fresh insert and re-use the shell. Little Boppers AI2s are available in two different styles: Hidden-PUL and Wind Pro. They are basically the same, except for what makes up the water-resistant layer. In the Hidden-PUL version, that layer is polyurethane coated polyester knit (PUL), a commonly used diaper fabric. In the Wind Pro version, that layer is a top-quality technical fleece produced by Polartec that is both breathable and water-resistant. The Hidden-PUL is trimmer fitting. The Wind Pro version is more breathable. Both versions of AI2s have a three-petal bamboo and cotton soaker topped with velour. The One Size option includes a snap-in booster that can function as a small newborn soaker on its own, a belly snap cover, and a fold-down rise. The Sized versions have hidden-belly snaps, so baby feels nothing but smooth fabric against the skin. What are Fitteds? Fitted diapers look similar to AI2s from the outside, and include two parts (a shell and a snap-in soaker) but they are not waterproof on their own. Normally, a Fitted is used with a separate waterproof Diaper Cover over it. Little Boppers Fitteds are available in two styles: Traditional Fitted and Hybrid Fitted. They are the same, except for what material makes up the hidden body layer between the outer print and the interior velour. In the Traditional Fitted, that hidden body layer is bamboo interlock, an absorbent layer. In the Hybrid Fitted, that hidden body layer is anti-pill polar fleece, a non-absorbent layer that can improve absorbency by helping the pee be distributed throughout the rest of the diaper rather than soaking through the crotch. Both versions of the Fitteds have two-petal bamboo and cotton soakers, topped with velour. The One Size version includes a small snap-in booster than can function as a newborn soaker on its own, a belly snap cover, and a fold-down rise. The Sized versions have hidden-belly snaps, so baby feels nothing but smooth fabric against the skin. What are Diaper Covers? Diaper Covers are not absorbent on their own. They are water-resistant and intended to be worn over an absorbent diaper of some sort (such as a Fitted, Prefold, or Flat). 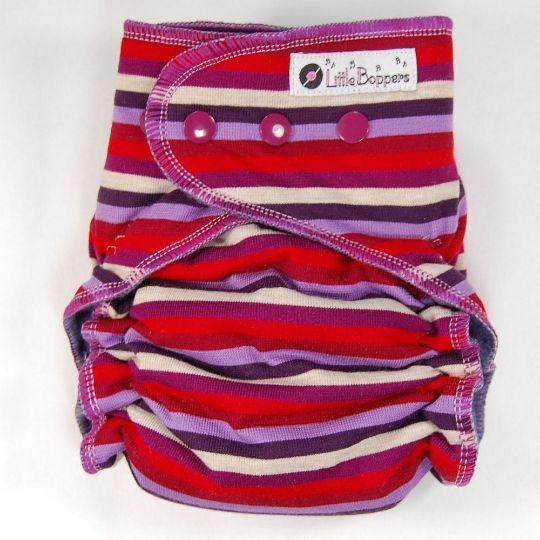 Little Boppers Diaper Covers are available in two versions: (Hidden-PUL and Wind Pro). They look like the AI2 shells, except there are no snaps on the back because they do not include any kind of insert. Although they look like the AI2 shells, they are actually made from slightly larger patterns because they are intended to be worn OVER a diaper so they need to fit a little bigger. The only difference between the two styles is what makes the water-resistant layer. In the Hidden-PUL version, that layer is polyurethane coated polyester knit (PUL), a commonly used diaper fabric. In the Wind Pro version, that layer is a top-quality technical fleece produced by Polartec that is both breathable and water-resistant. The Hidden-PUL is trimmer fitting. The Wind Pro version is more breathable. 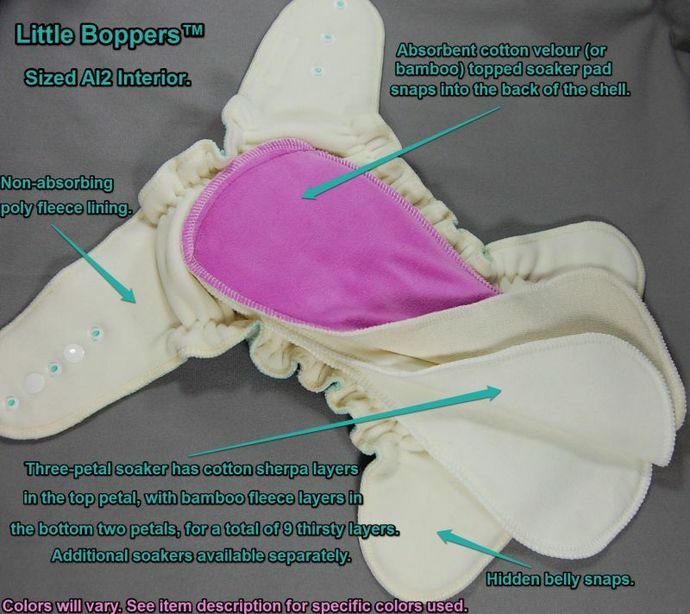 Little Boppers Diaper Covers are a great choice if you already have a stash of prefolds, flats, or fitteds. NEWBORN fits approx. 6 - 15 lbs (2.7 - 6.8 kg) with a 15" rise measurement. BIG NEWBORN fits approx. 8 - 18 lbs (3.6 - 8 kg) with a 16" rise measurement. SMALL/MEDIUM fits approx. 10 - 25 lbs (4.5-11.3 kg) with a 17" rise measurement. MEDIUM/LONG fits approx. 15 - 30 lbs (6.8 - 13.6 kg) with an 18" rise measurement. LARGE fits approx. 20 - 40+ lbs (9 - 18 kg) with a 20" rise measurement. X-LARGE fits approx 30 - 55+ lbs (13.6-25kg) with a 21 inch rise measurement. ONE SIZE fits approx 10 - 35+ lbs (4.5-16kg) with a 19 inch rise measurement. Do you have further questions? Feel free to contact me via the Contact page on this site or email me at anne@littleboppers.com.